To outsmart waste we need to eliminate the very idea of waste. In nature every system’s output is a useful input for other systems. How can we come closer to mimicking nature? By avoiding the creation of garbage and utilizing the garbage we’ve created, there will be less useless outputs. 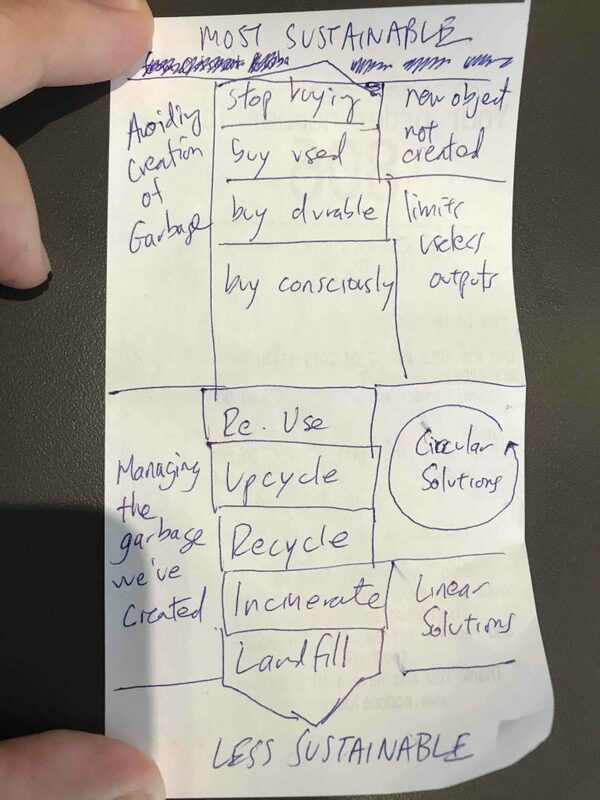 While self-educating on how to live zero waste in Saigon, I wanted to learn more about trash. Who better to learn from than an entrepreneur who has made this a life-mission? This book gave me a simple yet comprehensive framework for thinking about reducing waste. In elementary school we would have recycling drives. Whichever class brought the most newspapers and soda cans would win a pizza lunch! But the real issue is not recycling, but consumption. 90% of the environmental cost of products comes from resource extraction. Buying less means less waste and strain on the environment. If you must buy, consider the lifecycle of the product. Can you buy it used? Can you buy a more durable version? Can you buy a version that you can pass down to your children? A huge step to outsmarting waste is becoming aware of how much we waste. The average American tosses 4.4 pounds of trash every single day, including nearly 1 pound of food/day. Weigh your garbage for 1 week. How do you compare to the national average? How can you reduce this amount? Tom wants us to mimic nature and eliminate the idea of waste. How can you avoid useless outputs? He identifies 3 ways: re-using, upcycling, and recycling, which are “circular” solutions. In a circular supply chain, every output is cycled through until it becomes an input again (i.e. poop becoming fertilizer, someone else owning your jacket); in a linear supply chain, the output remains an output (i.e. that plastic bag at the landfill). Where can you donate your old clothes and used stuff? Can you upcycle (repurpose old materials for a new intent)? Finally, where and what can you recycle in your community? What 1 item you can reuse (or make available for reuse) and 1 item you can upcycle (or make available for upcycling)? UpStartist, Proudly powered by WordPress.